The Aleutian Islands are a series of 300 islands, stretching 1,400 miles from southwestern Alaska to Russia. An Alaska Marine Highway ferry makes the trip on a monthly basis April through October, from Homer and Kodiak along the Alaska Peninsula to the eastern end of the Aleutian Islands. After leaving Kodiak, passengers sail past the perfect cones of several volcanoes, the treeless but lush green mountains of the Aleutians and distinctive rock formations and cliffs. Whales, sea lions, otters and porpoises are commonly sighted and birds abound. The ship docks at the smaller villages of Chignik, Sand Point, King Cove, Cold Bay and False Pass for one to two hours. At the end of the line in Unalaska/Dutch Harbor, the ship stays in port for several hours, long enough for a tour designed specifically to accommodate ferryboat passengers. Unalaska's history is a mix of Unangan native culture and Russian fur trade. More than 3,000 Unangas (known since the Russian era as "Aleuts") lived in 24 settlements on Unalaska in 1759. Unalaska became a Russian trading port for the sea otter fur industry in 1768. In 1787, many hunters and their families were enslaved and relocated by the Russian American Company to the Pribilof Islands to work in the fur seal harvest. By the 1830s and 40s, only 200 to 400 Aleuts remained on Unalaska. Japan attacked Unalaska on June 3 and 4, 1942; as a result, all of the Aleuts on the island were evacuated and interned in Southeast Alaska for the duration of the War. On June 2nd to 4th, 2017, Unalaska commemorates the 75th anniversary of the Japanese bombing of Dutch Harbor and the relocation of the Aleut residents of the Aleutian and Pribilof Islands to southeast Alaska with ceremonies and presentations, traditional Aleut foods luncheon and mess hall meal, tours of forts and bunkers and flyovers by historic aircraft. The Russian Orthodox church is the oldest cruciform-style church in the country. A National Historic Landmark, it houses one of Alaska's largest and richest collections of Russian religious icons, artifacts and artwork. The first chapel was built in 1808. The building standing today was completed in 1896 and is the fourth structure. 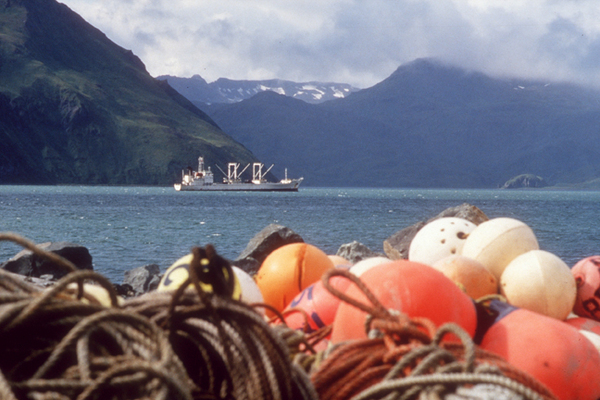 Unalaska's economy is based on commercial fishing, fish processing and fleet services. 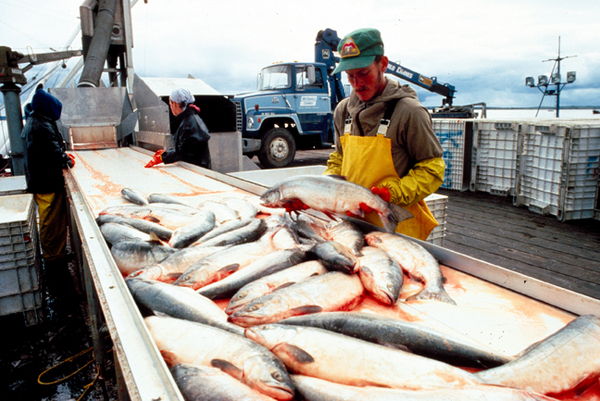 The community enjoys a strategic position at the center of one of the richest fisheries in the world and consistently ranks as the number one port in the nation for seafood volume and value, processing an estimated 800 million pounds annually. Built in 1999, the 9400 square foot museum is the only archeological research and storage facility for the Aleutian region. Located on the remains of a World War II warehouse, the site was once part of Fort Mears. Permanent displays focus on native Aleut/Unangan culture from prehistoric times to the present, the Russian-American era and the role played by the islands in WWII. Rotating exhibits showcase local artists as well as traveling exhibits from Russia. Call (907) 581-5150 or visit www.aleutians.org. Opened in 2002, the Visitor Center preserves the history and remnants along the Aleutian chain of the fortifications that US troops maintained against Japanese military occupation during World War II. The Historic Area is a 134-acre tract of land on Amaknak Island near the airport. The hilltop walk bears witness to the bunkers, gun mounts and magazines standing sentinel against foreign invasion. The area houses the military ruins of Fort Schwatka, the highest coastal battery ever constructed in the US; looming nearly 1,000 feet above the storm-tossed waters of the Bering Sea, a concrete bunker serves as an impressive monument to the war effort. Today, the Alaskan Peninsula and the Aleutians form a major portion of the Alaska Maritime National Wildlife Refuge. Sport fishing is one of the main reasons to visit Unalaska, where trophy size halibut, salmon and Pacific cod are plentiful. Sport fishing boat charters are available for full day excursions from June to September; tackle and bait is provided, but there is an extra fee for packaging and shipping fish. The staff at the Unalaska/Port of Dutch Harbor Convention and Visitors Bureau have an up-to-the-minute list of fishing boat charters available and it is recommended that you check with them at (907) 581-2612 or toll free (877) 581-2612; email: updhcvb@arctic.net. See our Unalaska Travel Directory for more information regarding F/V Lucille and Captain Dave Magone's fishing and whale watching charters. Kayaking secluded bays and inlets offer ample opportunities to explore and photograph the serene beauty of the area, observe seals, sea lions and otters, and perhaps mingle with fin or humpback whales as they surface. Kayak rentals and guided trips are offered by a local tour operator. What may appear to be public-access land is most likely privately owned by the Ounalashka Corporation and a permit to enter the land is required, so check with the OC before heading out. 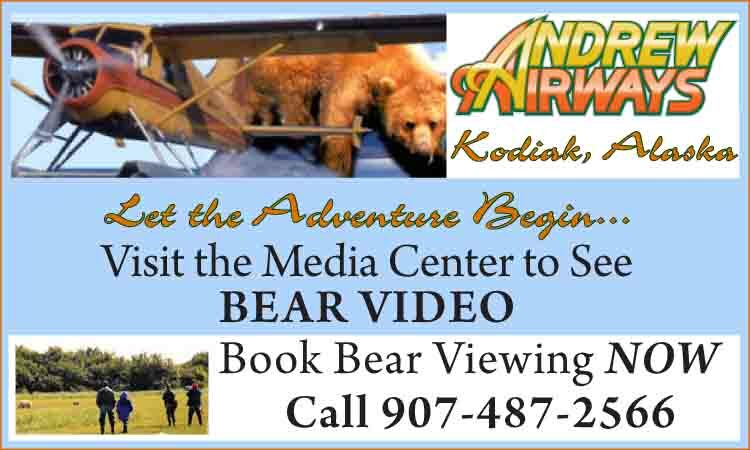 Their office is at 400 Salmon Way or phone (907) 581-1276. They offer an excellent hiking trail map to use as a guide; some of the trails are ancient 8,000-year-old Aleut paths. The trails range from 1 hour each way to Mt. Pyramid and Split Top Mountain or 2 hours each way for Beaver Inlet, to a full 8-hour day one way to Portage Bay. More than 120 varieties of wildflowers start blooming in June, including about a dozen species of wild orchids. Birding is a popular pastime for residents and visitors. Eagles, rough-legged hawks, Lapland longspur, savanna sparrows, rock ptarmigan, shearwaters, whiskered auklet and emperor geese top the list. Cultural artifacts unearthed at the Margaret Bay site, a large village occupation on Iliuliuk Bay, date to between 1000 and 3000 years ago and include more than 100,000 objects such as large blades, stone lamps and bowls, labrets, ochre grinders, pendants and miniature carved masks. Margaret Bay was declared a National Historic Landmark in 1985. 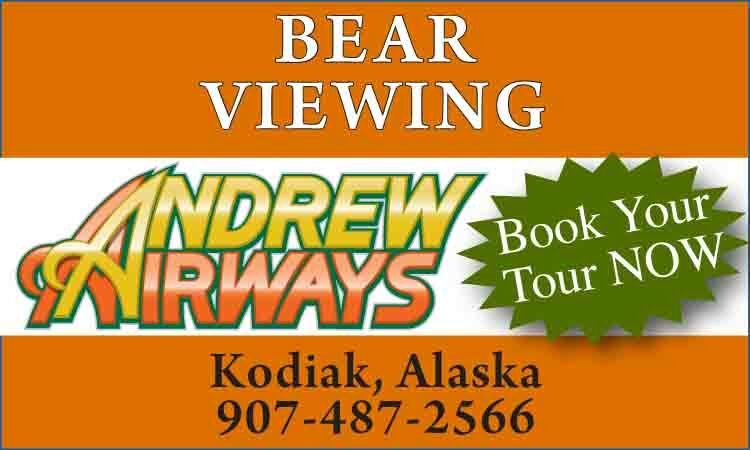 The City of Unalaska is fortunate to have great tour operators who utilize their own Aleut heritage or long-term commitment to provide personable hospitality and quality education to those who want to discover this very last stop on the western frontier of America. 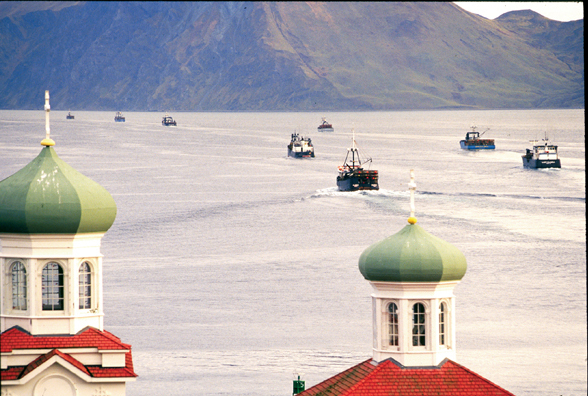 The island tours are comprehensive, with a drive through town and harbor, covering Aleut history and culture, Russian Orthodox influence and military presence during World War II. Depending on the tour and time frame, the operator may point out untouched tundra and beaches. 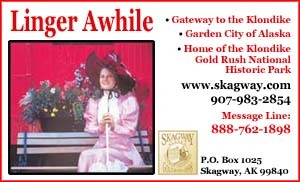 Optional side trips can include the Holy Ascension Russian Orthodox Cathedral, the two Museums and vista points providing lots of photo opportunities of the ocean, mountain ranges and harbor below. The commercial fisheries play an important role in Unalaska and Discovery Channel's exciting TV series "Deadliest Catch" has had everyone asking where the fishing boats tie up and if they can be seen on the tour. The season for king crab starts in September and finishes in May. The boats arrive during these months to unload their catch to the seafood processing plants, then return to their home ports. The tour will take the guests along cannery row. 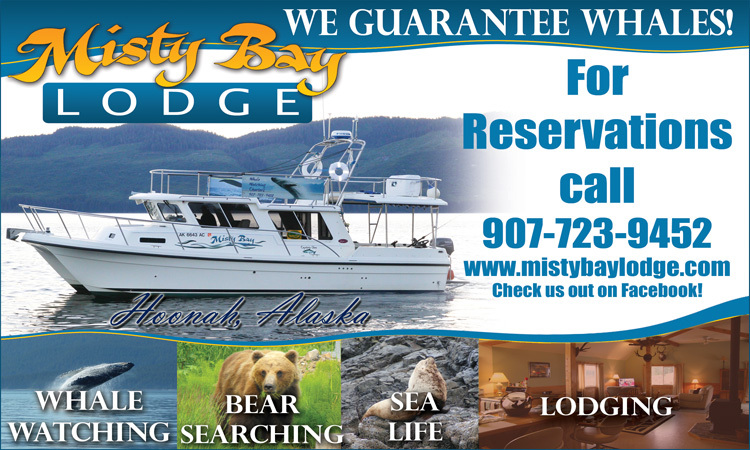 Unalaska offers a limited variety of sleeping accommodations from camping outside of town on Ounalashka Corporation land to all-inclusive lodge and small motel. The Grand Aleutian Hotel and UniSea Inn are the only two hotels in Unalaska.